Professional underwater photography doesn’t mainly rely on having the best camera around. Having a good quality underwater camera housing also counts a lot. It helps provide the underwater protection for the sensitive camera while underwater as well as offers the best features to help photographers capture images in the best possible light. 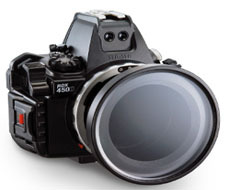 For the Canon EOS Rebel XSi and the EOS 450D, the Sea & Sea RDX-450D camera housing would be a good choice. The Sea & Sea RDX 450D features a Camera Quick Shoe feature to allow easy mounting and removal of the camera. This feature allows no more need for complicated gear alignments and positioning of the camera. It is easy enough even for beginners to do. The Sea & Sea RDX 450D camera mount also is equipped with two fiber optic cable sockets that allow the camera’s built-in flash to be connected to an external strobe. There is no need to set up an electrical connector. This feature also does away with the risks that may be involved with such connectors being submerged underwater. The housing’s strong and durable build has a depth rating for up to 60 meters or 200 feet underwater.